In an effort to recognize faculty and staff members for their outstanding service, Dr. Welsh has launched the ESyou campaign beginning with the fall semester, 2013. Each month during the academic year, the ESyou campaign will feature a different faculty or staff member who has demonstrated excellence in student-centered service. The purpose of the campaign is to showcase those employees who make an impact on our students every day, and for the students to get to know them. 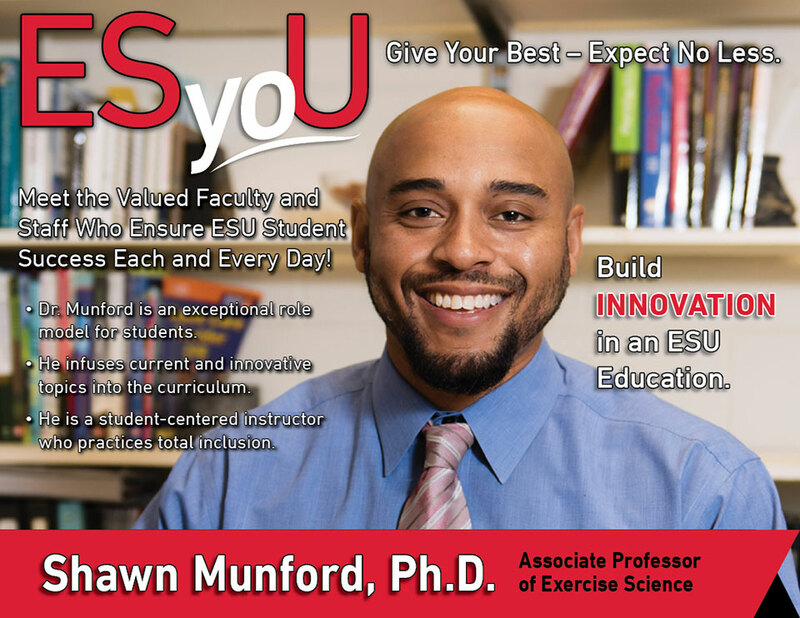 Congratulations to our next honoree, Dr. Shawn Munford, Associate Professor of Exercise Science. When you see Dr. Munford or any of our honorees around campus this year, please recognize their exemplary service by introducing yourself and thanking them personally. There is no greater acknowledgment! Dr. Munford is an exceptional role model for students. He infuses current and innovative topics into the curriculum. He is a student-centered instructor who practices total inclusion.